In this darkly comic, "promising debut from an assured new voice in Southern fiction" (Library Journal), an idealistic young farmer moves his family to a Mississippi flood basin, suffers financial ruin--and becomes increasingly paranoid he's being framed for murder. It all begins with a simple dream. An ambitious young environmental scientist hopes to establish a sustainable farm on a small patch of land nestled among the Mississippi hills. Jay Mize convinces his wife Sandy to move their six-year-old son away from town and to a rich and lush parcel where Jacob could run free and Jay could pursue the dream of a new and progressive agriculture for the twenty-first century. Within a year he'd be ruined. When the corpse appears on his family's property, Jay is convinced he's being set up. And so beings a journey into a maze of misperceptions and personal obsessions, as the farmer, his now-estranged wife, a predatory deputy, and a backwoods wanderer, all try to uphold a personal sense of honor. 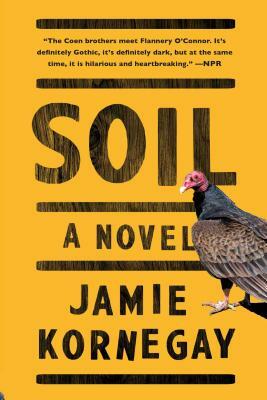 By turns hilarious and darkly disturbing, Soil traces one man's apocalypse to its epic showdown in the Mississippi mudflats. "The Coen brothers meets Flannery O'Connor. It's definitely Gothic, it's definitely dark, but at the same time, it is hilarious and heartbreaking" (Kyle Jones, NPR). Drawing on elements of classic Southern noir, dark comedy, and modern dysfunction, Jamie Kornegay's novel is about the gravitational pull of one man's apocalypse and the hope that maybe, just maybe, he can be reeled in from the brink. "Dig your hands into this Soil to find gutty and peppery writing, an almost recklessly bold imagination, audacious empathy, and a story so twisty and volatile that nearly every turn feels electrifyingly unexpected" (Jonathan Miles, award-winning author of Want Not and Dear American Airlines).